Betty Lou Crowley, 83, of Brookdale Bakersfield, CA, is a loving and adventurous woman with an insatiable “need for speed.” Though her life has been filled with exciting sights and experiences, a stroke nearly 3 years ago left Betty partially paralyzed on her right side. 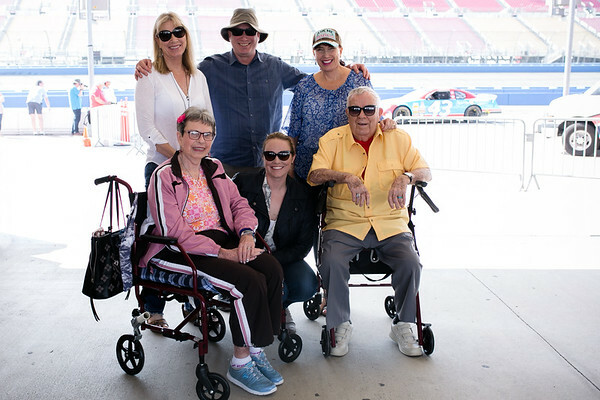 Overcoming obstacles and seeking thrills are part of Betty Lou’s nature, and it makes perfect sense that her Wish of a Lifetime puts her in the seat of a race car. Betty Lou grew up in Venice, California and has spent almost her entire life in California. Betty Lou, her husband Jim, their two daughters and one son, are quite the explorers. For nearly 12 years, Betty Lou and Jim traveled all over the United States in an RV enjoying their favorite activities including golfing, sightseeing and fishing. When she wasn’t checking out new destinations, Betty Lou worked as an RN. Currently she active in church life through bible study and helping the elderly attend worship services. Several of Betty Lou and Jim’s 10 grandchildren and 2 great grandchildren will attend the race! Over the past few years she has encountered medical challenges that have affected her ability to drive and walk, however Betty Lou keeps her mind and body strong by remaining active in her community and sporting a “daring” disposition. From roller coaster rides, hot balloons and skydiving, Betty Lou refuses to let obstacles get in the way of experiencing life in the fast lane. By fulfilling her wish, Betty Lou inspires those of all ages to keep pushing forward despite the challenges life brings.